Washington State Climatologist Nick Bond visited the Washington Corrections Center in Shelton, WA, as part of the facility’s Environmental Engagement Workshop Series. His visit, on December 26, 2018, featured a lecture on climate and salmon in Pacific Northwest for a group of 50 inmates. Bond spoke for nearly 90-minutes with time for discussion and questions from the students. Nick at the Stafford Creek Corrections Center in 2016. 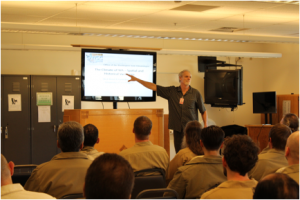 The workshop series began in 2009 and has offered more than 200 lectures and workshops for more than 2000 incarcerated students in the WA corrections system. Many passionate community members and scientists such as Bond have shared their expertise with inmates at facilities in Shelton, Gig Harbor, and Stafford Creek. Each lecture has been followed by a survey about the program and responses have show that the inmate-students are gaining environmental knowledge while their attitudes about the environment have steadily increased over time creating a positive culture shift within the prison system. Dr. Bond’s visit was organized by The Sustainability in Prisons Project (SPP), a partnership between the Evergreen State College and Washington State Department of Corrections. The SSP mission is to empower sustainable change by bringing nature, science, and environmental education into prisons. An influx of scientists and educational program has been welcomed by the program and the inmates have embraced the opportunity to gain knowledge and skills that will improve the prospects post-release. This is Bond’s second time volunteering with SPP, he previously spoke with inmates at the Stafford Creek Corrections Center in March, 2016. Former JISAO postdoctoral researcher Rachel White has also participated in the program. She spoke about climate change at the WA State Corrections Center for Women in 2017.